This is the results of a licensed contractor who got his license from a Cracker Jack box! The person who did this is a California Licensed electrician operating in Santa Cruz, Ca. Beware, all electricians are not qualified! 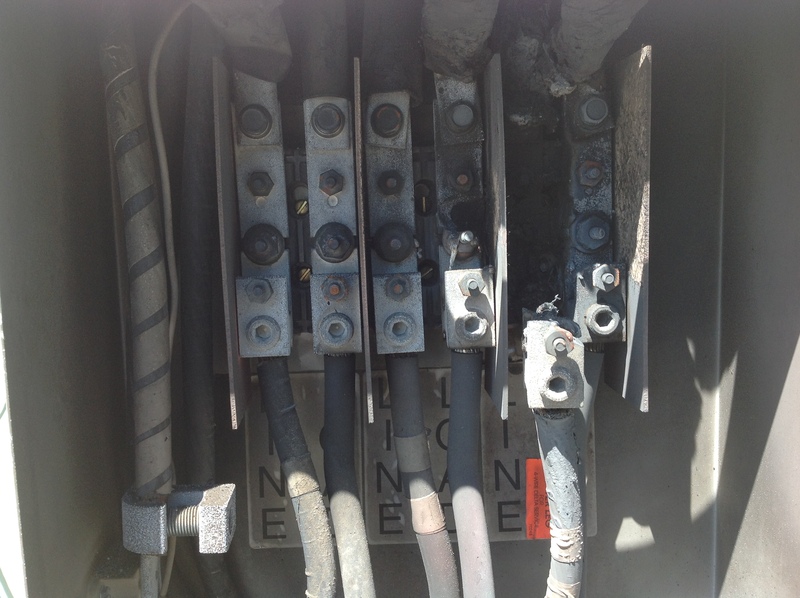 Top photo, meter socket.....burnt Second photo, how he left an added service...480 volt 3 phase 70 amp per leg for a 40 foot shipping container reefer unit.........those are 480 volt service wires hanging out of the box,He left it just like this, wires hanging out, Third photo puddles of formerly molten buss bars melted by the 480 volt arcing from C phase to B phase, arc blew through high voltage insulator, 4 th photo, what's left of the main 480 volt busses in 200 amp three phase box. He upgpgraded the box in second photo from 40 amps to 70 amps, hooked up the reefer without checking wiring in reefer, it is convertible 240 /480. It was wired 240 . This is what happened! This in a machine/welding fabrication shop that is under OSHA guidance. The reefer unit was extensively damaged and the main service is destroyed. It will probably be $5000 to repair the damage here, I haven't been into my inside panels as yet as the building owner is responsible for the building service, my customer is responsible for wiring in his unit and I do the electrical in unit. BEWARE.........not all contractors are qualified......trust and verify! 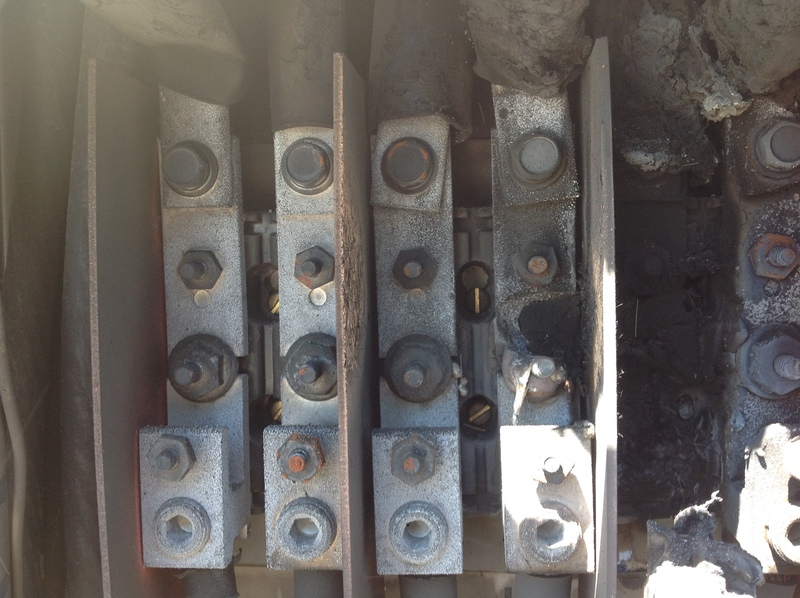 Two of the three PG&E 5000 volt fuses above the main transformer blew out of the housing. One leg "A" phase was hot, I had bleed over from something to phase B at 130 volts and Phase C at 31 volts.. Luckily the oversized grounding kept anyone from dying. This is an all metal building which could have been left 500 volt above ground! People die from this kind of stupidity......how did this guy get a license......did he ever do a commercial building.Sorry, I'm appalled.............His name is Scott........beware! @BB This was my Friday nitemare, Jeesh! The problem I've found when hiring electricans is among all the applications for a position there seems to be a very limited amount who have industrial experience. They may be extremely knowledgeable in house wiring but are out of their league in a commercial setting, the organization I last worked for insisted on using human resources to hire personal, needless to say we got some real beauties who didn't make it past the first week, It took much convincing to allow the forman to sit in during the intivew process. The sad thing is an electrical ticket or TQ can be obtained in B.C. Canada at least, without any practical experience other than domestic wiring. Previously there were restricted tickets which allowed holders to work within certain voltages but that was done away with when the electrical certification was handed to the Ministry of Aboriginal Affairs??? another group of suits without knowledge of what they were doing. 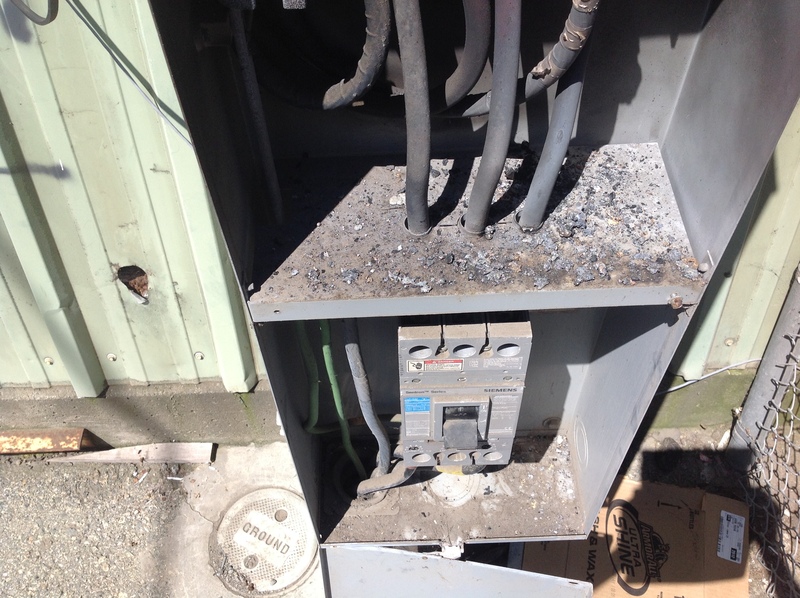 There is no excuse for the bad practice as shown above, appears to be a bypass of the disconnect in free air, thankfully nobody was injured or killed. Yes the cutoff switch was bypassed. It was left over when the tenant moved the machinery to another location. 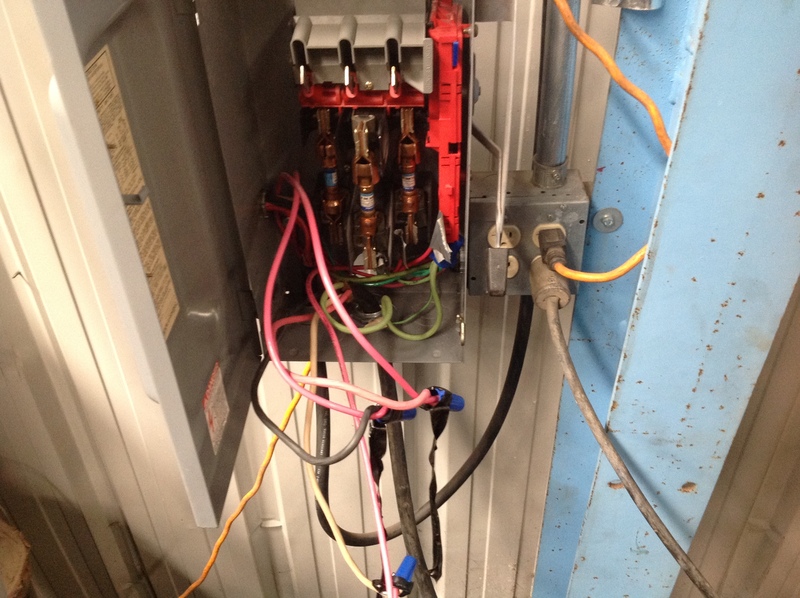 The circuit was protected only by the main 480 panel that is just inside the building. 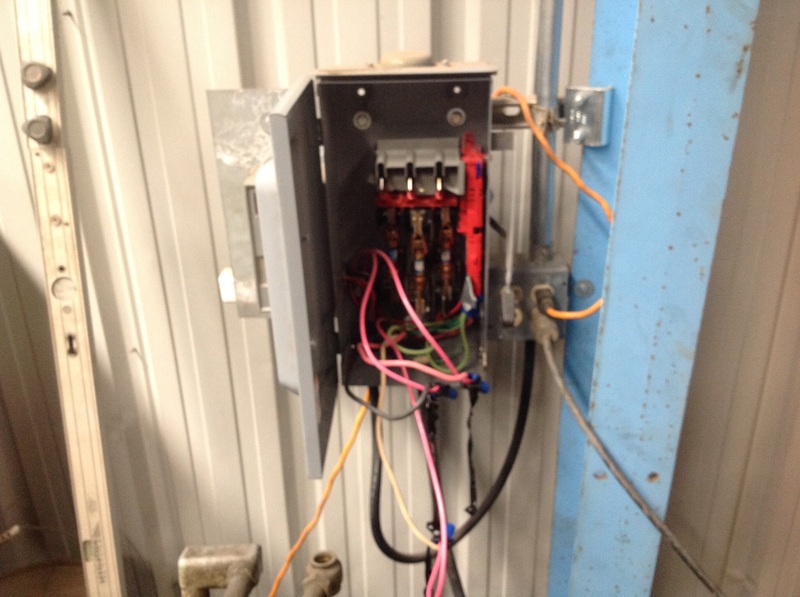 There is a 480-240 three phase transformer there that powers the 240 volt 3 phase panel that supplies power to some machinery and all the 120/240 circuits in the unit. It is habit of the tenant at my advice to shut down the transformer when not there as its idle consumption is rather large so only the 480 main and 277 lighting were live. The lighting contactors were buzzing loudly. I got the call and ordered that nothing be touched....exit the building without touching it. Santa Cruz is a bedroom community and almost all the electricians here are not qualified for 3 phase and 480 services. We have a very small amount of industry here but huge farms that have 60-100 h.p. water pumps.....I have no competitors in that area as I do 24/7/365 emergency service calls if you need badly enough. Farmers are realists, it's not how much....its can you get here now? Yep, I am out the door!
? Define the color codes as required in the code?
? Where do you get 277 volts?
? If the three hot wires are black red and blue what voltage service do you have?
? If the three hot wires are black red and orange what voltage service do you have?
? If the three hot wires are brown, tan, and orange what voltage service do you have? Most miss the first question, It is not green, white and black! Correct answer Green is always ground White is always neutral Orange is always " non-standard voltage" I.e. The stinger leg.........what is that......if you don't know you are not qualified! No ifs and or butts! Hot is not defined in the NEC, it can't be green, white , or orange It can be black, red, blue, violet, pink, purple or any color not defined. How many can answer that? All electricians should have a handle on that! Few can answer those questions! SAD! All of the above questions are in the NEC and the California "licensed electricians exam" and the electrical contractors license. How many can answer that correctly? I hear that Cracker Jack boxes come with an electricians license! Yikes! I take it the scope of work didn't require a permit? I expect we'll see a lot more of this sort of thing... too few young people going into trades for some time now, and we're losing the old guys who actually know stuff. Well, technically yes! But normally when we add a circuit a permit is not requested.......but in this case the reefer is a "different structure" and that would require a permit as well as its own ground rod and a 5 wire service. 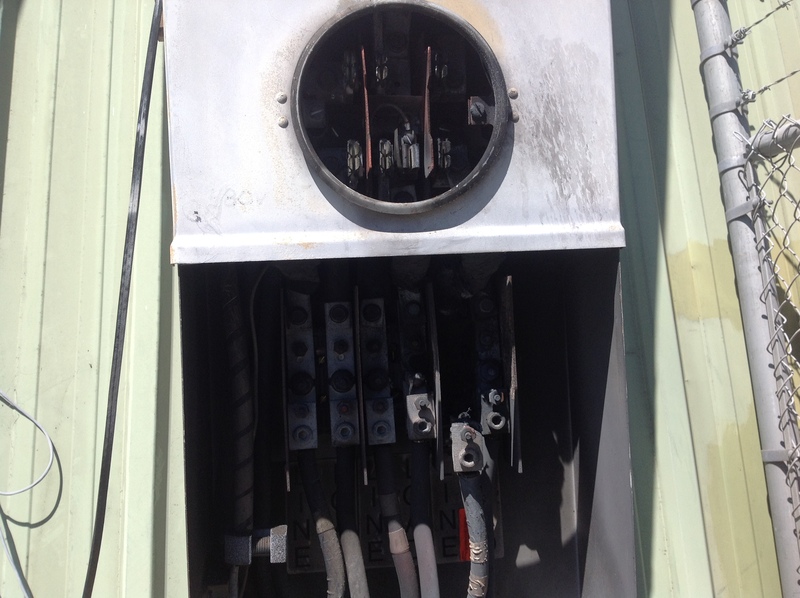 This installation has a four wire service and no local ground rod. If major fault happened personnel would not be protected! It is my responsibility to make sure that my customers' employees are protected. The reefer box in not in their area. Further corrected information, It wasn't the contractor himself but one of his crew who did that. The reefer was new, just delivered, $5000 in repairs for the reefer and $7000 for a new main service. 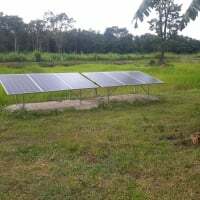 The power is not on yet as Pigs,Goats &Elephants hasn't scheduled it yet, they will call us in a few days to schedule, so add several workers that can't do their job for a week or more! Anybody that touches electricity in California is supposed to have a "California Electricians Card" .?? ?